Granted, the bulk of the report is classified, but it is not difficult to conclude that its tone is unlikely to diverge much from the unclassified annex — and that is deeply disturbing. Especially when just last month an Argentine prosecutor added to the growing paper trail on Iran’s nefarious activities in the Americas by releasing a 500-page report detailing how Iran has systematically built a clandestine intelligence network throughout the region “designed to sponsor, foster and execute terrorist attacks. Happy bloggiversary to American Digest, too! So near, and yet, so far. Disarray in Ecuador over the role of Wikileaks’ Assange in Snowden’s asylum bid is complicating the outcome, according to diplomatic mail. Mr. Assange—the antisecrecy-group founder who for the past year has been sheltered inside Ecuador’s London embassy—wrote to Ecuadorean officials Monday that he hoped his role in the Snowden matter hadn’t embarrassed the government, according to an internal Ecuadorean diplomatic correspondence obtained by Spanish-language broadcaster Univision Networks and reviewed by The Wall Street Journal. But in the note, Mr. Assange also offered public-relations advice to top Ecuadorean officials about how to handle the crisis. Mr. Assange’s earlier efforts on Mr. Snowden’s behalf had prompted one diplomat to caution that Mr. Assange could be perceived as “running the show” in Ecuador. Julian better watch it, or he may find himself out of lodgings, too. It didn’t matter, Senate Passes Immigration Overhaul. I’d call it an underhaul, since they didn’t read it. Welcome to 200 A.D., or, to the agnostic, 200 M.E. Government Unilaterally Renounces Trade Preferences With U.S. 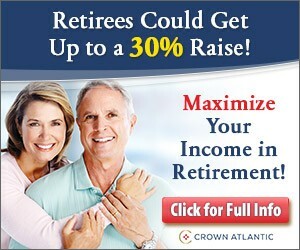 The trade preferences were expected to expire July 30. Officials of this small Andean nation lashed back at attempts by U.S. lawmakers to use a set of trade preferences that expire at the end of July as a bargaining chip to push Ecuador, which says it’s considering an asylum request by Mr. Snowden, away from supporting him. Ecuador said it was unilaterally renouncing these trade preferences. 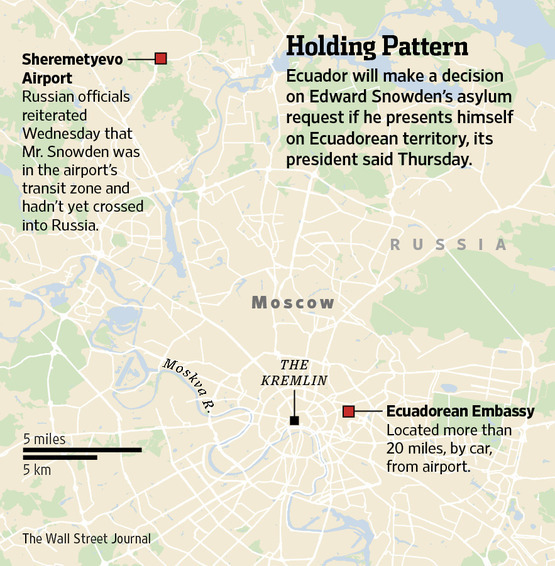 But the Ecuadorean government also reiterated that it hadn’t provided him travel papers that could aid his global journey to evade espionage charges in the U.S, casting fresh doubts about the tools that Mr. Snowden has at his disposal while he appears to remain holed up in the transit zone of a Moscow airport terminal. The U.S. has revoked Mr. Snowden’s passport and, without any travel documents, it is unclear how he could fly out of Moscow. posted images of what it said was a “safe pass” for temporary travel that had been apparently issued by Ecuador’s embassy in London to Mr. Snowden—a document he would need after U.S. officials said earlier this week they had canceled his passport. It sounds to me that the Correa regime may be haggling over price with Snowden. Mark my words, Correa’s not aiming for Hugo Chavez’s empty throne. Correa’s going to stay well away from that, and let Maduro and Cabello fight it out in Venezuela. IN the meantime, Correa is looking after Correa. Venezuela has made polite noises to Snowden, but Snowden may have to adjust himself to some limitations (link in Spanish, via Daniel), such as keeping his mouth shut for fear of being sent to jail, and taking blackouts, food shortages and no toilet paper in stride. “Ecuador’s foreign ministry said the country would consider whether to grant asylum to Mr. Snowden if he presents himself at one of the country’s diplomatic missions.” Well, that may not be as easy as it sounds. Look at Assange, sitting in the London embassy because England won’t grant him safe passage. Putin hasn’t thrown him out of the airport yet, but Putin’s not a guy you want to mess with, and the Ecuadorians would need Putin’s permission to transport him to and from the airport. whether there was a country that would allow him free transit on his way to Ecuador, which has said it would consider granting him asylum, and whether he had the temporary travel documents to get there. Someday someone will write a book about what Snowden didn’t know. The NSA leaker knows that President Rafael Correa wants to be the next Hugo Chávez. Why did Snowden pick Ecuador? Like Assange, he recognizes that President Rafael Correa is an anti-American leftist who has repeatedly clashed with Washington and has eagerly embraced U.S. adversaries. Indeed, Correa is a Hugo Chávez acolyte who reportedly receivedmoney from Colombian FARC terrorists during his 2006 presidential campaign; who in 2009 expelled a U.S. embassy official named Armando Astorga and forced the U.S. military to leave Manta air base (which had been used for anti-drug operations); who in 2011expelled U.S. ambassador Heather Hodges; who in 2012 withdrewEcuadorean troops from the U.S.-based Western Hemisphere Institute for Security Cooperation and also threatened to expel USAID from Ecuador; and who boycotted the 2012 Summit of the Americas to protest the exclusion of Cuba. His government has also strengthened ties with Iran, and there is compelling evidence that the Iranians have used their close relationship with Ecuador to evade international sanctions and access the global financial system. Ecuadorean foreign minister Ricardo Patiño has called Iran a “strategic partner,” and Correa has defended the Iranian nuclear program. Given his anti-U.S. record and his desire to succeed the late Hugo Chávez as the leader of Latin America’s populist-left coalition, there is good reason to expect that Correa will approve Snowden’s request. while Correa is known for his “anti-imperialist” rants and frequent denunciations of U.S. foreign policy, Ecuador still has a dollarized economy, and it still sends 45 percent of its exports to the United States (mostly oil, food products, and flowers), making America its largest trade partner. Since the early 1990s, Ecuador has benefited from U.S. trade preferences that are scheduled to expire on July 31. Thanks to these preferences, 23 percent of Ecuador’s U.S.-bound exports are exempt from tariffs. If Correa shelters Snowden, he will obviously jeopardize his country’s trade status. Venezuelan President Nicolas Maduro has hailed NSA leaker Edward Snowden’s “courage” and offered to consider an asylum application. Venezuela, on the other hand, may not want to rush to a decision, considering that the USA is its #1 oil customer and refiner. How would you arrange to send a password to unlock encrypted files if you’re working alone? For now, it looks like Edward Snowden may be stuck in Russia; the US revoked his passport, and, unless he has made other arrangements, his Russian transit visa (if he has one), may be about to expire, currently making him the world’s most famous illegal alien. Rick welcomes you to the Flat Earth Society. With a line like that, you must tune in! Today’s guest: Tom Harris, of the International Climate Science Coalition. Listen to it live, or archived for your convenience.